It is not new, yet, there are so many marketers out there (and well as agency folks), who have no real idea on what ‘Programmatic’ really means in media. Let’s start with the wikipedia explanation: Programmatic media (also known as programmatic marketing or programmatic advertising) is technology that automates the buying, placement, and optimisation of media inventory, replacing human-based methods. In this process, supply and demand partners utilize automated systems and business rules to place advertisements in electronically targeted media inventory. It has been suggested that programmatic media is a fast-growing phenomenon in the global media and advertising industry. Programmatic platforms are coming into their own these days, and there are quite a few around. The number keeps going up. 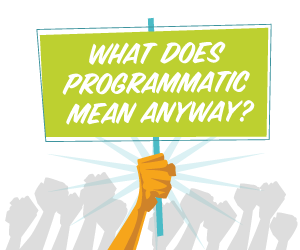 And, there’s a lot of jargon that comes with it: RTB, SSP, DSP, DMP, and more… A 2014 Forrester study found that only 23% of marketers properly understood programmatic buying. Changes are happening every week, and the whole concept is going through rapid evolution. Today, programmatic is being used to transact video inventory, marketers are being challenged to learn the nuances between buying display inventory and video inventory programmatically. Because data is critical, , data management platforms (DMPs) are taking on an increasingly important role. Most media professionals agree that DMPs are key to future of programmatic marketing. The way programmatic works with “inventory” is also evolving. While most programmatic inventory was remnant display inventory in the early days, this is now no longer valid in the singular. There are so many new of private exchanges, select marketers can programmatically purchase publishers’ best inventory. And, programmatic is now in video territory, meaning, it has gone beyond just display ad front. Many media agencies leverage technology partners with access to ad exchanges, while others have chosen to develop their own trading desks that allow them to directly transact in media programmatically. Programmatic media buying allows the use of audience insights and technology to tailor messages to a particular individual, at a particular moment, in a specific context, ultimately enabling an additional layer of value. Programmatic media is transacted across a wide and diverse array of mediums including digital media (desktop, mobile and social media), TV), Print, Radio and some OOH. Technological innovation, an abundance of data, and liquidity in the media has given way to a more democratised process, which has changed the mechanics of transacting media in a manner that has never been possible before. The industry is going through something akin to the automation of the financial markets in the 1980s, allowing much more precision and personalisation.